﻿ Who would you rather have for a game-winning drive - Ben Roethlisberger or Cam Newton? 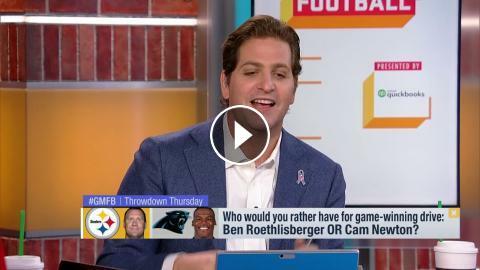 Who would you rather have for a game-winning drive - Ben Roethlisberger or Cam Newton? Ben Roethlisberger on why he slimmed down this offseason: "because it's Year 15"
Who would you rather have for game-winning drive - Tom Brady, Aaron Rodgers or Rams offense? What are Carolina Panthers QB Cam Newton's Hall of Fame chances? What's wrong with Cam Newton and Panters offense? Ben Roethlisberger on 2018 Steelers: "I'm really excited about this group"
Which QB is harder to defend - Russell Wilson or Cam Newton? David Tepper's three priorities as Carolina Panthers owner: "Winning... winning... (and) winning"
Ben Roethlisberger: "I don't need to give Cam Newton advice, he's Superman"
Is 2018 Carolina Panthers QB Cam Newton's best season yet? Who would be more reliable in a game winning drive - Aaron Rodgers or Tom Brady? Should Ben Roethlisberger be more willing to mentor Mason Rudolph? Who's more likely to dethrone Brady in the AFC - Philip Rivers or Ben Roethlisberger? Should Cam Newton be ranked higher than No. 25 on the NFL Top 100? Does Cam Newton need to be 'Like LeBron' and carry Panthers to playoffs?